Gov. Nikki Haley (R, SC) delivered the official Republican Party rebuttal to the President. Dr. Jill Stein (G, MA), the likely Green Party nominee, provided a critique from the left. Gov. Gary Johnson (L, NM), the likely Libertarian Party nominee, provided a critique from the right. 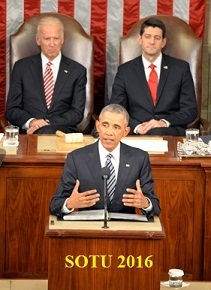 Barack Obama: Broad economic change causes economic insecurity for workers. Gary Johnson: National debt, approaching $20 trillion, is bankrupting us. Gary Johnson: It's racism to judge others by their birth, like Trump does. Barack Obama: Discrimination ultimately makes US less safe. Barack Obama: Private sector is lifeblood of economy but needs limits. Barack Obama: Business should be more community oriented. Barack Obama: Food stamps didn't cause financial crisis; Wall Street did. Jill Stein: 80 billionaires own as much as the lower 50% of world. Gary Johnson: States are finally seeing the failure of the War on Drugs. Barack Obama: Universal Pre-K and computer science classes on horizon. Barack Obama: Prioritize free community college and reducing student debt. Jill Stein: Cancel college debt: it's now $35,000 per student. Jill Stein: Make public college education free. Jill Stein: Repeal incentives for privatization/charters in NCLB. Barack Obama: Clean energy for climate change & creating new business. Barack Obama: Make technology work for us on climate change. Barack Obama: 7 years of investment in solar & wind nationwide. Jill Stein: "All of the above" policy puts fossil fuels above all. Jill Stein: Climate change causes record storms, floods, and drought. Margaret Flowers: World will reach the limits of its carbon budget in 2018. Cory Booker: Trump would denigrate relationships with Muslim countries. Barack Obama: World order in flux but US still dominates. Barack Obama: US should learn lessons from Iraq and Vietnam. Barack Obama: The Cold War is over; lift 50-year embargo on Cuba. Margaret Flowers: End U.S. global hegemony and become cooperative partner. Gary Johnson: I'm a real skeptic on trade agreements, but I would sign TPP. Barack Obama: TPP facilitates US control over Asian market. Barack Obama: TPP cuts 18,000 taxes on products made in America. Jill Stein: Oppose bipartisan job-killing corporate trade agreements. Jill Stein: Fight global trade deals' "investor-state" court system. Barack Obama: Governing cannot work without compromise. Barack Obama: We've got to make it easier to vote, not harder. Tom Vilsack: Start conversation with a respect for the 2nd Amendment. Barack Obama: 18 millions people have gained health insurance. Barack Obama: Prioritize finding a cure for cancer. Barack Obama: Lead eradication of malaria and HIV, like we did with Ebola. Gary Johnson: ObamaCare's promise of lower cost simply isn't happening. Joe Biden: Increased funding for NIH to highest level in a decade. Barack Obama: Self-defeating to overstate ISIS threat. Barack Obama: We spend more on military than next 8 nations combined. Barack Obama: Talk of economic decline & military weakness is just hot air. Gary Johnson: Spying on U.S. citizens dismantles the 4th Amendment. Margaret Flowers: Empire Economy: projects the Pentagon rejects get funded. Pope Francis: Imitating tyrant's violence means we take their place. Jill Stein: FactCheck: 2.5M deportations counts removals, not returns. Nikki Haley: FactCheck: US does have history of religion-based exclusion. Jill Stein: We're deporting more immigrants than ever, 2.5M under Obama. Jill Stein: Deportation of vulnerable refugees is morally abhorrent. Nikki Haley: Immigrants have come for generations to live the dream. Nikki Haley: Don't follow the siren call of anti-immigration anger. Nikki Haley: Protect our borders, our sovereignty, and our citizens. Barack Obama: US economy is strong: 900,000 new jobs in the past 6 years. Barack Obama: Need retraining programs for workers who lose jobs. Barack Obama: We've cut unemployment in half during my term. Barack Obama: America is defined by innovative spirit: it's in our DNA. Jill Stein: We are in state of crisis--for economy, ecology & democracy. Barack Obama: Must continue to make technology accessible. Barack Obama: We protected an open internet & got more Americans online. Barack Obama: Put Americans to work on 21st-century transportation system. Jill Stein: Green New Deal for efficient public transportation. Gary Johnson: We are no safer after years of failed nation-building abroad. Barack Obama: Expand tax cuts for childless low income workers. Jill Stein: Millions thrown off food stamps because they can't find work.